Do you like to read stories? What if they are based on real events and have to do with the most famous CMS? Yes, that's what we thought! 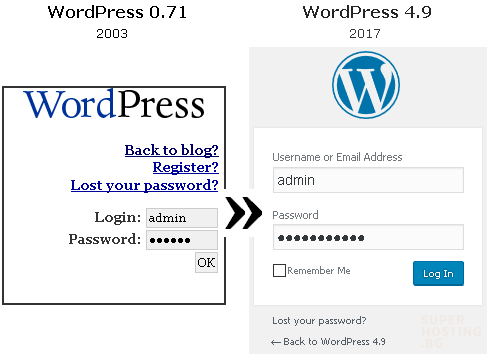 Therefore, we decided to briefly tell you the history of WordPress by revealing popular and unknown facts from 2003 till present days. 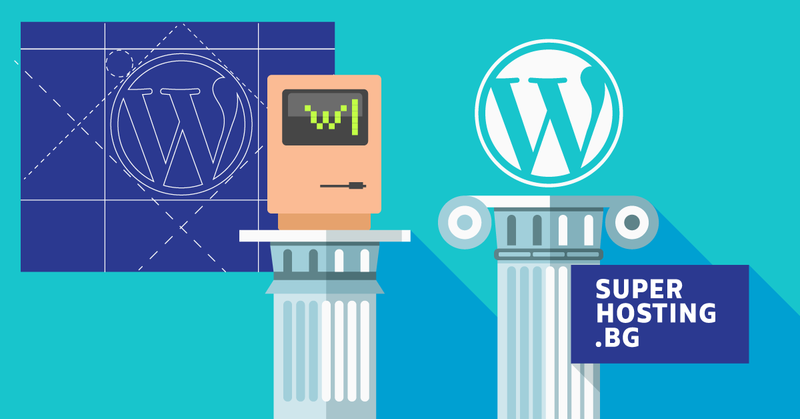 In the following lines we will tell you more about how WordPress has evolved over the years and conquered the web by winning millions of fans. 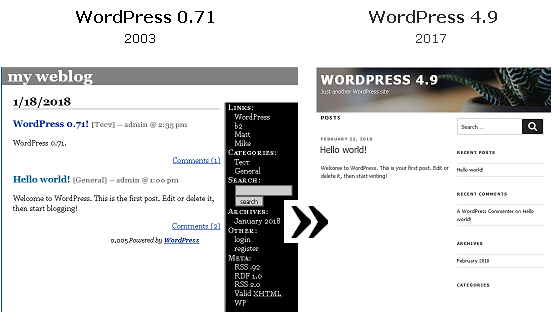 The official birthday of WordPress is on May 27, 2003 when its first release 0.70 became available for download. However, on January 25, 2003 the concept of WordPress was born by a comment left below one of Matt Mullenweg's blog posts as he was only 19 years old back then. It all started with Matt's dilemma what actions to take after the blogging platform he was using these days had been abandoned by its developer and hadn't been updated for moths. He wondered whether to move to another blogging platform or take the open source code of b2/cafelog and develop it further into a separate project. b2/cafelog was the most suitable choice for Matt at that time because it was licensed under the GNU General Public License (GPL) unlike the other options available back then such as MovableType, TextPattern and Blogger. Mike Little got in touch with Mullenweg by leaving a comment on Mullenweg's blog thus indicating his interest in joining the fork of b2/cafelog. Fork happens when developers take a copy of the source code from one software package and start independent development on it. Matt and Mike started a project named WordPress as its purpose was to improve the b2/cafelog system. This resulted in the most famous ready-made content management system which nowadays is being used by 30% of the top 10 million websites. By now the CMS's appearance and user interface have gradually improved, but there is one main aspect which has been preserved to this day. This is the system’s intuitive design as well as the continuous improvement and development based on the users' needs and requests. Since Matt is a big jazz fan, each new WordPress release is named after a famous jazz musician. The latest 4.9 version is named after Billy Tipton. 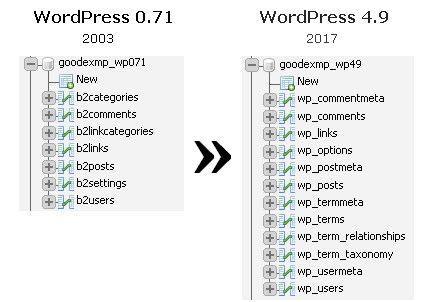 Since the first release in 2003 up to 4.9, there have been 33 WordPress releases. The content management system's admin panel has gone through numerous improvements and modifications. However, the feeling of intuitive operation with the panel's features and easy content management is still preserved. Тhe Dashboard in the admin panel first appeared in version 1.5. In earlier versions such as 0.71, 1.0, 1.2 the page for creating a post was loaded after logging into the admin panel. The layout of the CMS home page is defined by the used theme. At the beginning, the appearance, CSS and images of the design did not have a separate directory or theme. As of version 1.5 the template and theme system was introduced as the CSS files were moved to a separate directory (wp-content/themes/default). The first WP theme ever was based on the Kubric theme. This was the default WordPress theme from versions 1.5 to 2.9. As of version 3.0 themes are named after the year when the respective WP version is released (if the month is December, the name corresponds to the upcoming year). 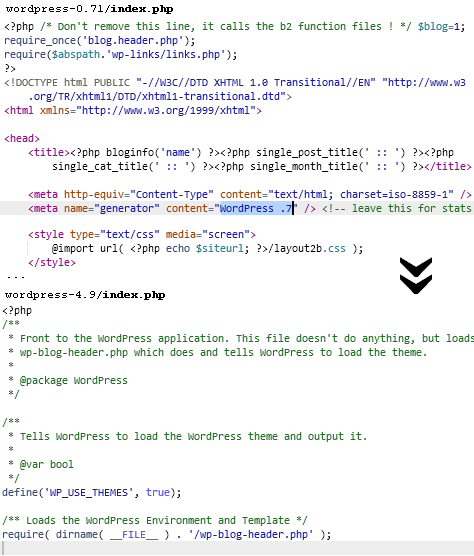 Just like in the admin panel, from the very beginning till present days the WP home page sticks to clean design. As of version 1.5 users can create pages with WordPress and change the themes by using the newly introduced template system (/wp-content/themes/). Thus the index file has also been modified. For a long period the index.php file contained only data on the function for calling and loading the current theme. From 1.5 to 4.9 this file did not change as it contained only two important lines except for the comments describing the code. The database structure and capabilities have been continuously improved by the removal of old and adding new tables which optimize the way data in the system is stored, grouped and linked. Version 2.3 introduced a new flexible mechanism enabling data to be grouped and classified – taxonomies. Posts can be grouped into categories or tags. The embedded into WordPress groups are: category, post_tag and post_format. Through custom taxonomies data can be grouped in various ways. From 2003 to 2017 over 30 versions were developed and released. WordPress kept getting better, more useful and accessible as today it holds 60% market share of the ready-made content management systems (Joomla! 6.5%, Drupal 4.6% …). Nowadays it is easy to add different features to your website by only choosing and installing the required plugin. Before version 1.2, plugins did not exist. Although automatic plugin installation was not possible until version 2.7, the system kept gaining popularity as 2.5.x versions have been downloaded approximately 1.984.047 times. In the following article you are about to find out what are the most interesting things in each WP version and more curious facts. Subscribe to our blog and do not miss it! Speaking of WordPress, in SuperHosting.BG we simply cannot miss mentioning our tool WordPress Manager. Have you already tried it?